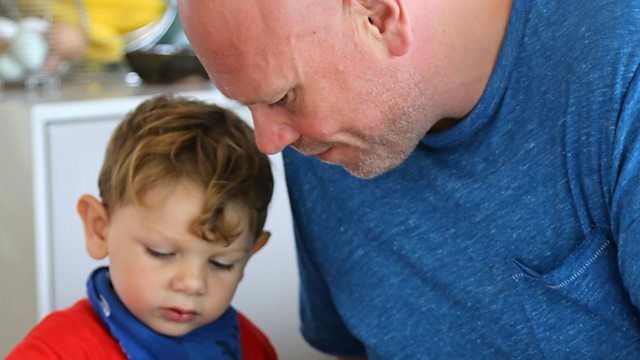 Tom Kerridge recruits eight families keen to change their lives for the better. Tom wants all his gang to get cooking, whatever their age or experience. Tom's six-step plan for transforming family eating habits is nearing the half way stage. So far, the eight families are eating many more homecooked meals and have learnt how to plan ahead to save time and money. Now, for the third step of his plan, Tom wants to get everyone in the family helping out in the kitchen, not just one designated cook. Tom believes that whatever our age or experience, we will have a healthier relationship with food if we do some cooking. To prove you are never too young to start, he makes a family-favourite recipe with his three-year-old son Acey. Together they make filo pastry triangles with feta cheese and greens, a dish inspired by memories of holidays in Greece. Tom hears from Payal, one of the mums in his gang. She cooks for her family when she gets home from work and would love a night off once in a while. So Tom drops round to teach Payal's daughter Niharika, ten, and son Krish, seven, how to cook one of his easy and delicious recipes - Asian-style glazed chicken thighs. Payal hopes that sharing cooking duties will catch on for the family and take their food transformation to the next level. There is a request for help from another of the mums in Tom's group too. Becky and her husband Mark both work but Becky does most of the cooking. She now wants Mark to do his share. Tom comes round and he and Mark cook a butternut squash pasta bake. It goes down well with the young family and Mark is clearly proud of what he has made. Becky thinks that seeing both mum and dad cooking sets a good example for their five-year-old twin boys Charlie and Jack. Inspired by Tom's recipes, one young member of Tom's gang decides to spend a week of her holidays at a cookery school for kids. Eight-year-old Sophia joins her classmates making fresh pasta with basil and lemon sauce, a grown-up dish they love making and eating. Before Tom's experiment began, Sophia didn't cook and was scared of trying new foods and flavours. Not any more. Are You Ready for Tom Kerridge’s Fresh Start? Think you don't have the time and know-how to cook from scratch most days? Think again!